Paris Creperies employees Andrea Cabral (left) and Christina Chhoeum worked in the kitchen of the popular Brookline Restaurant. BROOKLINE — Looking back on a career spanning 43 years, Henry Patterson sees a lot to be proud of. Bel Canto, an Italian restaurant he founded when he was just 23, became a chain. As a consultant, he has mentored dozens of Boston’s most successful restaurateurs. Now, he is hoping to leave a legacy promoting an unusual restaurant management technique that rewards employees, from dishwasher to waiters, for finding ways their workplace can save money and boost revenues. Dubbed “open-book” management — so named because it opens the financial books to the entire staff — it might sound like yet another self-help fad of the business kind. But it’s hard to argue with its early success: The first restaurant that experimented with Patterson’s system realized such exceptional results that each full-time worker is set to take home an extra $6,000 this year. After being steeped in the inner workings of the restaurant’s books, Norton and her colleagues systematically began identifying ways to save money and increase sales. Many suggestions seem prosaic: Substituting a washable utensil for a disposable version they bought by the thousands; cutting strawberries differently to reduce food waste; positioning an outdoor sign perpendicular to the sidewalk for better visibility. But even those small efficiencies added up. One employee, deputized to review the cost of ingredients, found that a supplier had quietly started charging more for several staples. She quickly haggled the company back to the original price. And it’s showed in the bottom line immediately. Net operating margins at the Coolidge Corner restaurant have soared from 5.5 percent last year to 18 or even 20 percent for some periods this year. That’s unheard of in the US restaurant industry, where margins are traditionally paper-thin — just 3.7 percent on average this year, according to financial information company Sageworks. Another benefit is that employees are often surprised to learn how marginally profitable the restaurant business can be; the tendency is to assume the employer is reaping huge rewards on their labor. 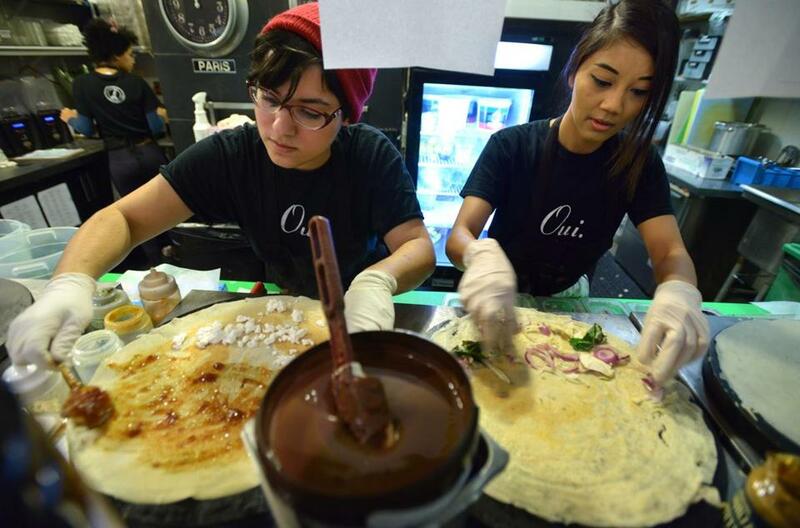 Paris Creperie declined to reveal exactly how much additional profit it realized from the open-book system, but said much of the gain is distributed to its 22 workers in the form of quarterly bonuses. The company also receives a share of the additional profits, and uses some of that money to further invest in the business. Owner Chuck Silverston credited the fast results to his employees. Patterson’s open-book system is loosely based on a model pioneered by Jack Stack of Springfield Remanufacturing in Missouri. Other companies have adopted a somewhat similar employee-owned business model. The open-book system shares the principle of empowering low-ranking workers and sharing profits with them, but retains the traditional ownership and management model. That could make it an easier sell to restaurant owners who are reluctant to give up control. Business specialists in the service industry said open-book management is not a particularly new idea, although several said they were astounded by the scale of its success at Paris Creperie. It has seen limited adoption in the restaurant business, they said, because many executives have an exaggerated and shortsighted fear of increasing costs, and of investing in employees who may soon leave. Schlesinger said companies would do well to study the open-book system, given the national debate over raising the minimum wage, which has not kept pace with inflation and the cost of living. 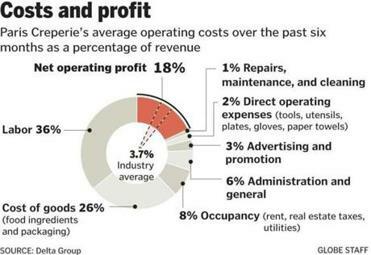 A little levity was mixed into a discussion on “cost of goods sold” by Paris Creperies employees as part of their shared role in maximizing profits. At Paris Creperie, consultants from Patterson’s firm, Delta Consulting Group LLC, helped teach employees the basics of business — understanding the balance sheet, how the restaurant accounted for purchases and sales. Delta charges a flat fee to clients for its services. Each worker was given the company’s key metrics, then let loose to see whether they could better them. The results not only improved the restaurant’s bottom line, Ludden said, but the morale among employees, too. Not to mention the peace of mind that several thousand dollars in additional pay brings for workers who earn $10 to $15 an hour, plus tips, depending on their position. Confident of the model’s success, the 63-year-old Patterson vows to convert every Boston restaurant that will listen to him. He stands to profit if more restaurants pay him to implement the open-book system, but Patterson insisted there’s a moral component as well.